Question may have asked before but didn't see it. Why do coins that normally does not have hole, have a small hole. Is there a reason or did someone just put a hole in it? I have a 1989 500 Pesetas from Spain with a little small hole right in front of the lady. Quote: "David52" ​Question may have asked before but didn't see it. Why do coins that normally does not have hole, have a small hole. Is there a reason or did someone just put a hole in it? I have a 1989 500 Pesetas from Spain with a little small hole right in front of the lady. Coin collecting is the only hobby where you can spend all your money and still have some left. For more modern coins, like yours, decoration is the most likely reason. For coins of the 1800s and back, holes were usually because the pants had no pockets, or the owner did not want to lose it. 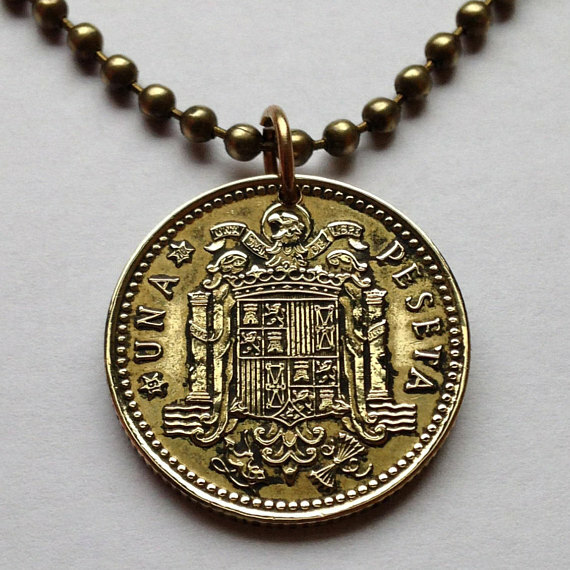 It was easy to put a hole in a silver coin, and wear it around your neck. I also have an alpaca bag from c. 1880, that has about 26 coins holed and sewn to one side of it, probably for both reasons. ​For coins of the 1800s and back, holes were usually because the pants had no pockets, or the owner did not want to lose it. It was easy to put a hole in a silver coin, and wear it around your neck. ​This was very common among the Chinese for over a thousand years, (stringing coins for convenience) as well as in other East Asian cultures, but I can't imagine 17th-early 20th century Europeans going to the trouble of putting a hole in a coin just to wear it around their neck. There seem to be far too many holed European coins to be strictly for decoration (as necklaces, watch fobs, etc. ), and stringing it around your neck would be frustrating to a pickpocket. Some older coins were holed as "touch pieces", to cure various afflictions. If the coin was not worn continuously, the malady could return. A number of Far Eastern countries have long histories of stringing coins, and many of these were often minted with holes in them, to facilitate stringing them.